With so much time in one place, one of the main ways astronauts relax on the International Space Station (ISS) is to enjoy the astonishing views of earth from space. There are several windows to allow astronauts to look back at our planet, but by far the best place to enjoy earth gazing is the Cupola. The Cupola is a dome structure that is used as a control room for astronauts operating ISS equipment. With a diameter of 80cm, the top circular window of the Cupola is the largest window ever to fly in space, and there are six other windows that open up the view in all directions. An insider's view of earth from the Cupola. Take a look at some of the extraordinary pictures taken by astronauts from the ISS Cupola from the European Space Agency. Although life in orbit can be tough, it's also truly special and unique experience for astronauts. The overall sense of looking back at planet Earth and seeing it as a whole entity rather than a collection of countries and factions is an unforgettable and moving experience. With a constantly moving and changing view from its low Earth orbit of around 350-400km above the planet's surface, the ISS is a superb place to take up space photography. Details on the Earth such as glaciers, agricultural fields, cities, and coral reefs are easily visible with high-resolution cameras. Take a look at some of the beautiful pictures captured by astronauts on the ISS at Windows on Earth Explore all the different galleries and think about how you might curate your own personal collection. You can create a space photo gallery as a personal project or you could do it with your family, class, or friends. It's interesting to find out which images of earth from space stand out and appeal to different people. Which images would you choose? How would you arrange them? Remember to use picture credits if you plan to print any of the photos from Windows on Earth. 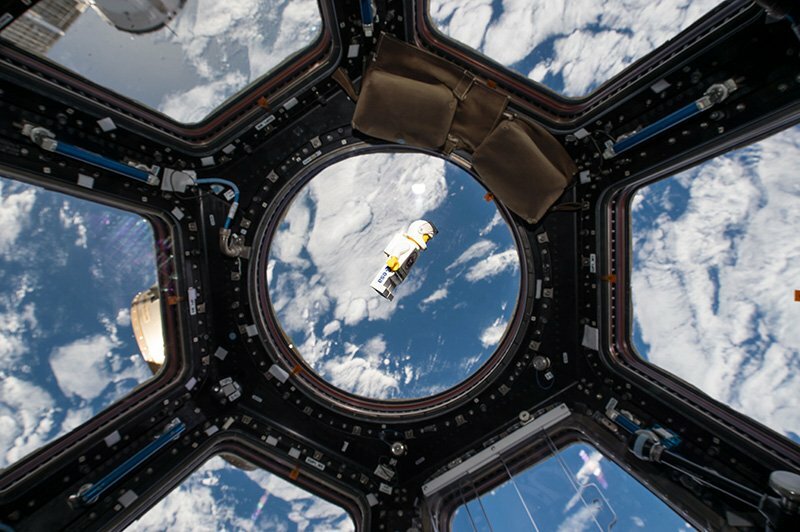 Astronaut Don Pettit shares his experience of taking photographs from the International Space Station. Another fascinating project is to identify the location of photos taken from space at night. Cities at Night offers you the chance to get involved and help the community to classify some of the images generated from the ISS. Just like the astronauts on the ISS, why not try taking photos of the night sky, capturing the constellations and star trails. Under the right circumstances you might be able to capture the ISS. You need a clear sky and you need to looks late in the evening, during the earliest hours of darkness. This is so that while you, on the surface of Earth, are in darkness, the ISS is still lit by the sun. Use the ISS Tracker to check if its flying over your part of the planet at good time.